The app, which is actually incorporates content from the book written by Bob Davis and published by John Wiley & Sons, costs $9.99 in App Store. Like the book, it helps aspiring photographers learn about shooting images with minimal lighting equipment. 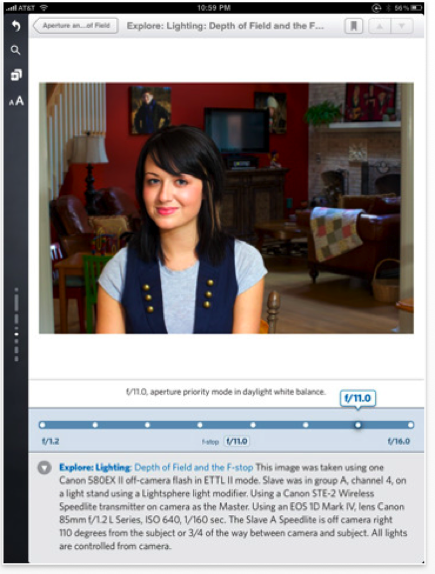 The app includes over 100 videos, interactive diagrams to help you understand the effect of lighting and equipment settings, workshop videos, high resolution images, and the full text of the original book. Beyond the subject matter, the interactivity of of the app is actually pretty impressive. For example, the app includes interactive photography simulators within the e-book, allowing you to change one paramter to see how it affects an image. So by swiping a bar underneath a photo will show the effect of changing lighting positions, light-strength and more. Within the book, you can also watch videos from the author’s lighting and photography workshop and commentary on his photography and how he captures his images. And you can access the book through Inkling’s own iPad app, which will add social sharing abilities and more. The app itself is a testament to just how cool Inkling’s technology can be for digital publications on tablets. The startup has already struck a number of content development partnerships with textbook publishers, including Cengage Learning, John Wiley & Sons, McGraw-Hill, and Wolters Kluwer, and will be rolling out over 20 titles for the iPad over the next few months.